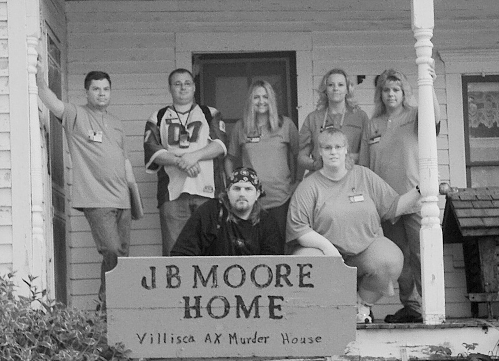 On June 10th, 1912, sometime between midnight and 5:00 a.m., an unknown assailant entered the home of J.B. Moore and brutally murdered Two adults and 6 children in their beds. The two bodies in the room downstairs were Lena Stillinger, age 12 and her sister Ina, age 8, houseguests of the Moore children. The remaining members of the Moore Family were found in the upstairs bedrooms by City Marshall Hank Horton. 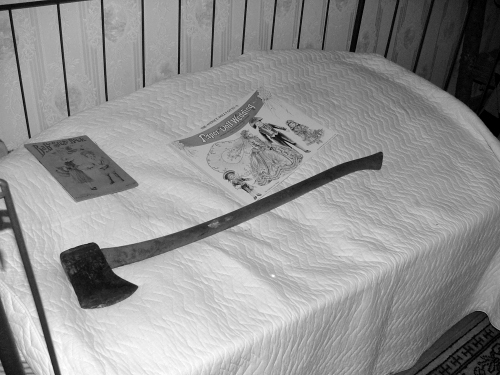 Every person in the house had been brutally murdered, their skulls crushed by an axe as they slept. Josiah Moore, age 43, Sarah Montgomery Moore, age 44, Herman Moore, age 11, Katherine Moore, age 9, Boyd Moore, age 7 and Paul Moore, age 5. Upon arriving at the house, we took a quick tour of the grounds inside and out. A detailed map was drawn of the house and grounds as a quick reference for later on in the night. The owners, Martha and Darwin Linn, were there to greet us. Darwin gave us a tour of the home accounting the murders, evidence and suspects in great detail. Equipment was brought in and we began the initial setting up our surveillance equipment. 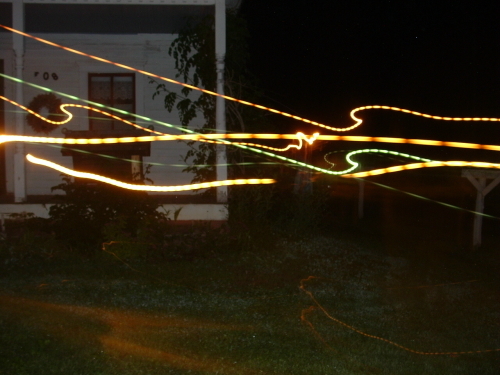 Three wireless cameras were setup throughout the house with a monitor outside in the barn. Two air temperature gauges were placed in the children's rooms. One downstairs where the Stillinger girls slept and one upstairs in the Moore Children's Bedroom. We split our team up into 2 groups. Group one (1) Amanda, Nathan, Chad and Jennifer Group two (2) Rob, Jeff & Deb. Group 2 entered the home first while group 1 remained outside monitoring group 2 from the barn. 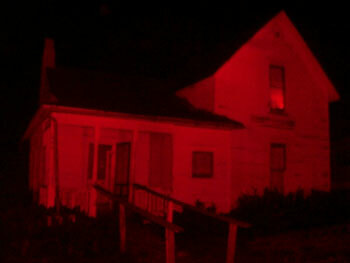 Group one (1) started upstairs in the parent's room taking EVP's. After an hour, one member of a group would document the current, high and low temperature of each of the children's rooms. A detailed hourly account of the temperature in each of the bedrooms were taken throughout the entire night. Each room was investigated thoroughly by team members during the night. Several times throughout the night the group tried to energize the house by bringing in EVERYONE in the group and expelling energy. Our hopes were to bring out anything that would draw on our energy and make it more apparent. Unfortunately, this didn't work. 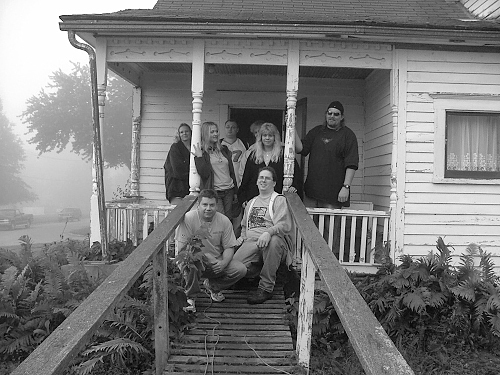 Although our attempts at capturing paranormal activity wasn't working out as we had hoped that night, we were pleased at a couple of things we did collect and document as actual paranormal activity collected on the property. A huge temperature drop was caught in the small blue child's room on the first floor. The high was 71.2, the low was 47.1, and the current temperature taken at the time it was recorded was 70.5. That means between the hours of 12:00 (midnight and 1:00 am) the temperature dropped 24 degree's to 47.1 then came back up to 70.5. This would be a considered a Major COLD SPOT.